It was a dark and stormy night. Naw, actually it was a kind of hot and humid late afternoon after a soccer game when we decided to go out for dinner. This is our first soccer season and my oldest is playing for the very first time. In this action shot, I’m pretty sure she’s thinking, “Wha…?” because she says that a lot during games. One of these days I’ll have to tell her how it’s played. Once I figure it out myself. It’s been unseasonably warm here which makes it a perfect time to head down to the beach. In my food snobbery I’ve often bemoaned the quality of San Diego restaurants, but I’ve been to two of the three PrepKitchen locations and both have been quite good. I’ll review them separately though since the menus are slightly different, and the venues are quite disparate from each other in feel. The one in Del Mar (which just reopened recently after a years’ worth of post-fire renovation) is just a couple of blocks from the ocean with ample outdoor seating and, if you peek a bit, a view of the ocean. There’s a glass enclosure around the outdoor seating, which makes it preferable in my view to the one in La Jolla, which was quite windy last time I was there. The tables and seating at the Del Mar location are also nicer — sturdier, and more permanent-feeling. I can only explain this photo by the fact that there’s a full moon tonight. Every day, between 3 and 6 PM PrepKitchen Del Mar offers a happy hour menu featuring $3.75 tapas and $5 sangrias. There seems to be some daily variation in what’s offered, but here’s a link to a sample happy hour menu. It’s also super-easy to make a reservation, via OpenTable — because of my sheer laziness and the fact that technology has rendered me nearly incapable of speech, I only really go to restaurants that allow me to book online. We started off with the Salami and Tapenade (left), Salmon Tartare (right) and White Bean Bruschetta (front). I was excited about ordering the tapas since I’d had it at their sister restaurant Whisknladle, where it was excellent. Sadly, this tapas didn’t hit the mark. First off, bread seemed to be part of these dishes in overweighted proportion — it seemed odd that three of the five tapas items I ordered were dominated by bread. Although none of these were bad, they weren’t outstanding either. Bread aside, the portions seemed unusually small, even for the size of the mini-dish. Bread quality was excellent, however. The sangria was just ok.
Next came the Patatas Bravas, of which I had fond memories from my happy hour at Whisknladle. It hit the mark on crunchiness — nicely done — and texture, balancing the crunch with the smoothness of the sauce, which had just a touch of slow-simmered chile to it. It was certainly a notch above the first three dishes that came out, but still a notch below the one I had at Whisknladle. The last tapas dish I ordered was the Caramelized Brussels with Bacon. This one was a real disappointment — the brussels were beyond caramelized and quite charred. Caramelized onions were a nice touch, but the sauce was far too sweet for what could have been a lovely savory dish. At this point, I decided: no more tapas. Out came the Local Mussels and Frites ($16.50), in a white wine, garlic and aioli sauce. The mussels were plump and juicy with a healthy texture, and the sauce was out of this world. The frites were perfectly crisp on the outside, soft inside and seasoned with salt and parsley. I dipped many a frite in the delicious sauce, and when the frites were no more, my husband asked for a spoon. The sauce alone was worth the trip and the demoralizing tapas experience. I am telling you to get the mussels! You will weep. Next came the Cutting Board. A half board, at $16, is perfect for two people. It came with a lovely assortment of rilettes, olives, house mustards and tapenade, salami, cheeses and walnuts, accompanied by their signature ciabatta. The small olives were particularly tasty, and the cheeses were smooth and tasty. The kids had the WnL Burger, which featured gruyere, cured bacon, caramelized onions and a farm egg ($16.50). I didn’t have a bite but they seemed to enjoy it. We finished off with the Bread Pudding a la Mode ($7.50) with nutella, banana and caramel sauce. It was nicely done, flavorful without being overly sweet. After dinner, we took a leisurely stroll along the beach. I think that old people are on to something…if you eat early enough you can work off 1/100th of what you just ate and enjoy a nice sunset. Or maybe you just want to go to bed. So would I recommend PrepKitchen Del Mar? Definitely. I wouldn’t make a special trip for the tapas — in fact, I won’t get it next time — but I’ve never gone wrong with the full-priced menu items. 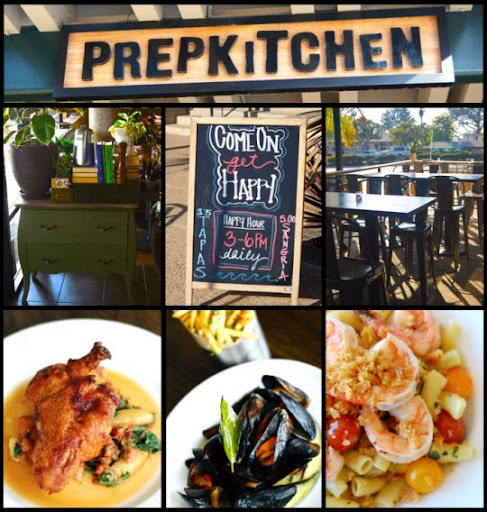 Judging only based on the latter, PrepKitchen makes it onto my list of favorite San Diego eateries. Posted on September 29, 2012 by Sandi. This entry was posted in Restaurants and tagged Del Mar, Del Mar restaurants, happy hour, PrepKitchen, restaurant reviews, San Diego, San Diego restaurants, tapas. Bookmark the permalink.